Francis Kodzo Amedahe was born in the village of Kpoeta in Ghana’s southeastern Volta Region in 1953. 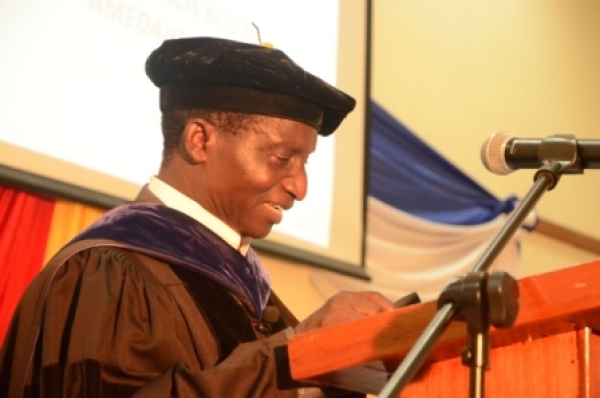 Unlike most from his village he had the opportunity to receive an advanced education, including a Bachelor of Education (1984) and Master of Education (1989) from the University of Cape Coast (UCC) in Ghana, and a doctoral degree from the University of Pittsburgh in Pennsylvania in the USA (1998). After teaching primary and middle school students as part of his National Service, Dr. Amedahe joined the teaching staff at UCC where he moved through the ranks to become a Professor in Educational Measurement and Statistics, served as Chair of the Department of Educational Foundations, and as the Vice Dean and Dean of the School of Education. Dr. Amedahe is the author or co-author of more than two dozen academic articles, has served as a consultant to USAID, UNICEF, and the Association of African Universities. He has mentored over 30 graduate students’ theses and dissertations, served as the President of Community University College in Takoradi, Ghana (2011-12), and given numerous academic conference and other presentations on educational assessment. What makes Dr. Amedahe stand out among other academics in Ghana is the development work that he undertook in his hometown after serving as a Fulbright Scholar-in-Residence in the School of Education at Elon University in North Carolina in the USA, from 2006 to 2007. Near the end of his time at Elon, Dr. Amedahe encountered the newly inducted Ghana Class of Periclean Scholars a group of then around 30 undergraduate students that had committed to a three-year academic service learning program. Dr. Amedahe, along with his wife Cecilia, made an appeal to the students and their faculty mentor, Dr. Heidi Frontani, to help him bring year round access to healthcare to the approximately 10,000 people of Kpoeta through the construction of a small health clinic. The students rallied in response to Dr. Amedahe’s moving plea and raised enough funds in the month prior to Dr. Amedahe’s return to Ghana to change the plan from building a five-room clinic to constructing a ten-room one. Although he had startup funds in hand, and the members of the Kpoeta community had already cleared some land and started building the cinder block walls, completing the clinic would require considerable oversight and additional funding. Every few weeks Dr. Amedahe made trips between UCC and his home town to work with the Paramount Chief of the Kpoeta Traditional Area, Togbe Gadze VIII, to deliver building supplies, check on the progress of the villagers who were building the walls of the facility, and hire professionals to take care of the roofing, plumbing, and electricity. Within one and a half years the clinic was completed and the students wondered what else they might do to assist the people of Kpoeta. Dr. Amedahe pointed out that many health professionals leave Ghana for better pay and work conditions in the USA, UK, and elsewhere or do not want to serve in remote locations like Kpoeta; he suggested that the students fundraise for the construction of clinic staff housing because the Government of Ghana had provided the facility with a nurse in late 2008. By the time the students graduated in May 2010, a block of two two-bedroom apartments for clinic staff had been completed and the Government of Ghana had provided additional staff. In an unusual twist for Elon University’s Periclean Scholars program, Dr. Frontani recruited several younger students to carry on the fundraising that the founding members of the Ghana class had started and encouraged the alums to continue their involvement with the Kpoeta partnership post-graduation. That the relationship with Elon would not end with the graduation of the original Ghana Periclean class was welcome but challenging news for Dr. Amedahe who now needed to continue to oversee construction in his home area. Kpoeta is located more than a five hour drive from UCC and in the early years of the Elon-Kpoeta relationship, travels included navigating a final stretch of road from Kpedze to Kpoeta that then was little more than a lumpy dirt path. The terrible road between Kpedze and Kpoeta had long been an issue for the people of Dr. Amedahe’s home town, so he decided to work with the Paramount Chief, who once worked for the highway department, to see if the road could be leveled, widened, and paved. It took a few years of repeated requests, but today the road is paved. Due to fundraising from newer Ghana Pericleans and alumni members, the Kpoeta clinic also has a second block of staff housing that consists of two one-bedroom apartments. The clinic officially became part of the Government of Ghana’s network of health facilities in late 2011 and since then has received regular deliveries of medical supplies from Ghana’s Ministry of Health. In 2012, Dr. Francis Amedahe and his wife Cecilia opened a hotel in the Cape Coast area. The Hotel Francilia is a popular destination for vacationing Ghanaians and visitors to Ghana, including celebrities that come in for Carnival (Fetu Afahye) in early September. The hotel is conveniently located near Cape Coast’s many attractions, including its beaches, markets, and Cape Coast Castle. Visitors who would like to make a donation to the Kpoeta Health Center may do so at the front desk.